Branzino has easily become my favorite fish. I had it a bazillion times in Italy, a bazillion more at Italian restaurants, and now I make it at home regularly. It's delicious whole, but for this recipe I have the fishmonger at Whole Foods filet it for me. Y'all... 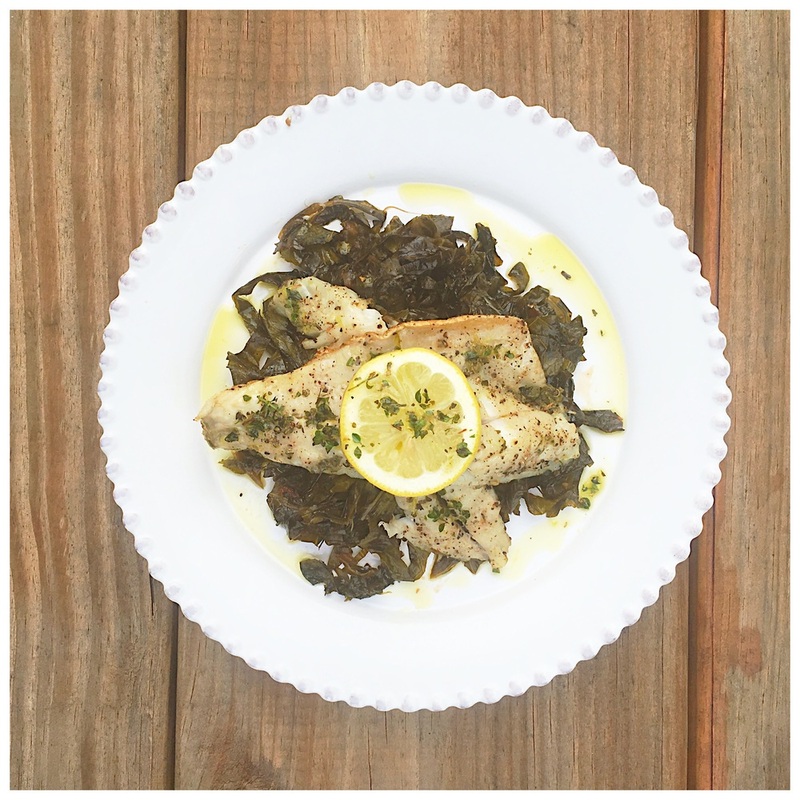 It's to die for, and the collards put a little southern spin on it. Italy, meet Mississippi! Mississippi, meet Italy! 1. Heat olive oil in a large saute pan. Add garlic and red pepper flake and cook for one minute. Add the collards with about 2 tsp of salt and 1 tsp pepper. Cook until slightly wilted. Pour in the wine, balsamic, and maple syrup. Bring to a boil then simmer and cover. Let cook for 20 minutes or until liquid is absorbed and collards are tender. Taste and add more salt if needed. 2. Preheat oven to 425 and heat an ovenproof saute pan over high heat. In a small bowl, mix together the extra virgin olive oil, lemon zest, oregano, and thyme. Set aside. 3. Brush filets well with olive oil on both sides and sprinkle with salt and pepper. When the pan is smoking, add filets skin side down. Cook for 90 seconds, top fish with lemon slices, and transfer to the oven. Cook for 8 to 10 minutes or until fish is cooked through. 4. Plate by laying down a bed of collards. Place the fish on top and spoon the lemon herb oil over the fish.